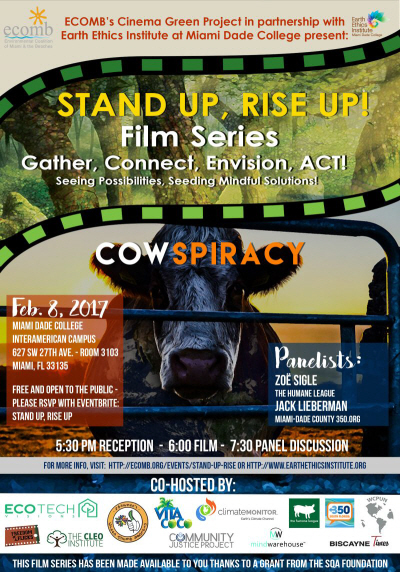 On Wednesday, February 8, at 5:30 p.m., ECOMB’s Cinema Green Project, in partnership with Earth Ethics Institute at Miami Dade College, presents “Cowspiracy” from the Stand Up, Rise Up! film series. The film will screen at Miami Dade College’s Interamerican campus, 627 SW 27 Avenue, room 3103, Miami, FL 33135. After the film, there will be a panel discussion with Zoë Sigle, Director at South Florida Grassroots, and Jack Lieberman of 350.ORG. All Stand Up, Rise Up! films are free, but tickets through Eventbrite are required. This film is uncovering the secrets of the agricultural business in the US. Animal agriculture is the leading cause of deforestation, habitat loss, ocean “dead zones” and many other negative impacts on the environment. The director aims to show the full impacts on what animal agriculture does to the environment, and how we can start changing the way we eat to save the environment. The Stand Up, Rise Up! film series is being shown at various locations in Miami, from January 25 through March 22. The next film is “Taking Root: the Vision of Wangari Maathai ” on Wednesday, February 15, at EcoTech Visions, 670 NW 112 Street, Miami, FL 33168.